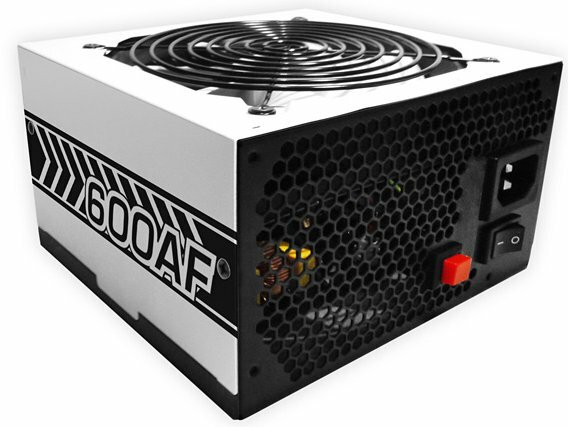 RAIDMAX introduces a new 600W 80Plus Bronze power supply; the RX-600AF. The unit has a MSRP of $59.99, it has two +12V rails with 22A each and is cooled by a large fan. RAIDMAX, a computer chassis provider, is pleased to announce their new 600W Power Supply – RX-600AF. The RX-600AF provides reliable power to your PC while reducing electricity loss through its high efficiency design. With certified 80 Plus Bronze efficiency, the RAIDMAX RX-600AF converts up to 85% of the input electricity into usable energy. This translates to less electrical usage and lower energy cost. The powerful fan keeps the RX-600AF at optimal operating temperatures at regular usage. At times when you want to push your PC harder, the turbo fan controller gives the RX-600AF extra cooling ability anytime. RAIDMAX's newest power supply comes with numerous high quality connectors for secure connections to your hardware. With its white finish and elegant white fan, the RX-600AF's simple aesthetic design is not such much eye-catching as it is eye-pleasing. Including several safety precautions such as Short Circuit Protection (SCP), Over Voltage Protection (OVP), and Over Power Protection (OPP), the RAIDMAX RX-600AF ensures all your hardware is well powered while protecting them from power abnormalities.